Creena and her little brother, Deven, believe the cavern’s crystals can reunite their family at last. But before she can unlock their secrets, Integrator forces find their underground hideout, forcing a harrowing escape loaded with unexpected consequences. Do the Brightstars have what it takes to survive their final confrontation with the Integrator and his evil proponents? Or will the family’s longed-for reunion take place in another dimension of time and space? Find out in this suspense-laden conclusion to the Star Trails Tetralogy. Buy directly from the author and get an autographed copy for the same price, postage included! (USA only. Send requests regarding international rates to info@kallioperisingpress.com.) Want the entire series? Check out our selection of Box Set under the TETRALOGY SERIES TITLES tab. Is Refractions of Frozen Time in Your Library? 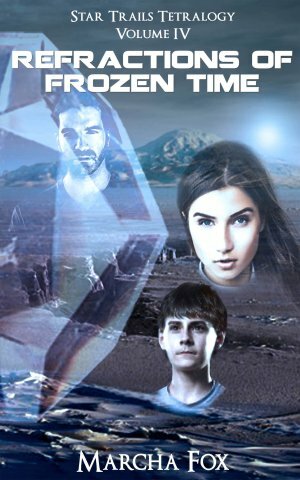 Print out this form to request your librarian to include Refractions of Frozen Time in their young adult science fiction collection.